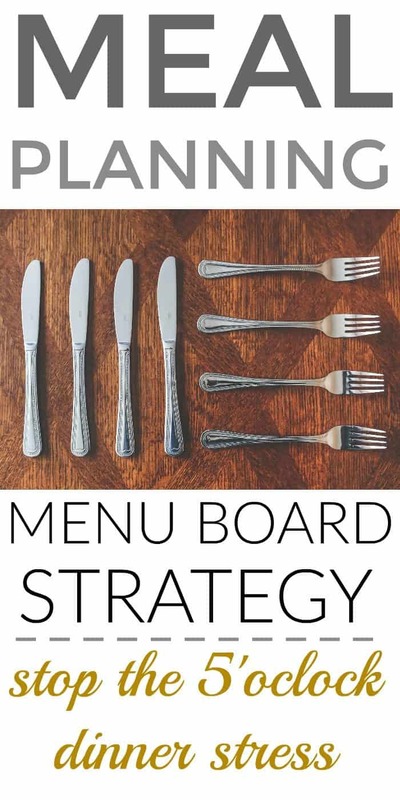 I created my meal planning menu board strategy in hopes of taking some stress out of my day. If there is one thing I have never been good at it’s meal planning. Some people are amazing at it, even planning meals down to the day. The thought of deciding what I will eat 4 days from now has always annoyed me. I barely know what I want to eat for my next meal. BUT with a family to take care of winging it doesn’t cut it. That usually turns into eating out or eating a bowl of cereal for dinner. Over the past few months I decided to take a new approach to my weekly meal planning to see if I could keep my family feed with out the dreaded 5:00 what’s for dinner thought. A couple of years ago I found a beautiful frame at a yard sale for $5! It was just the frame, no glass or backing but it was in excellent shape. So I grabbed it up knowing that I could make it into something to use at home. 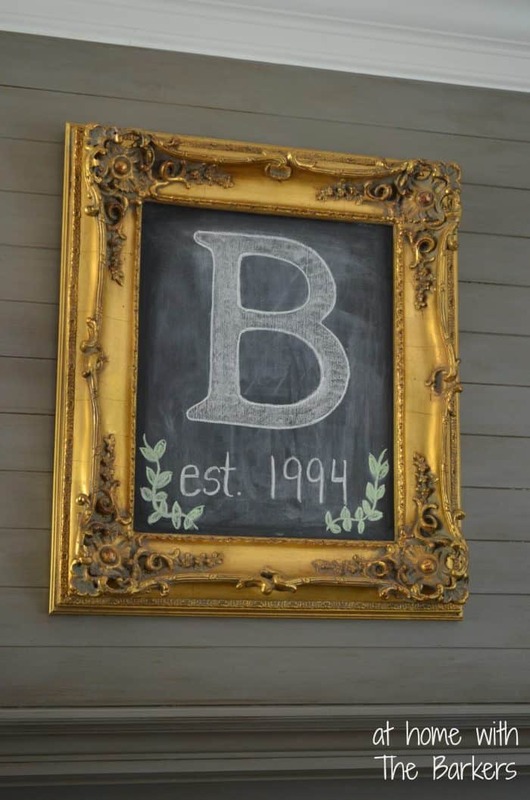 I created chalkboard art to hang above my mantel. Now it has turned into a great menu board for our weekly meal planning. NOW here is my meal planning menu board. 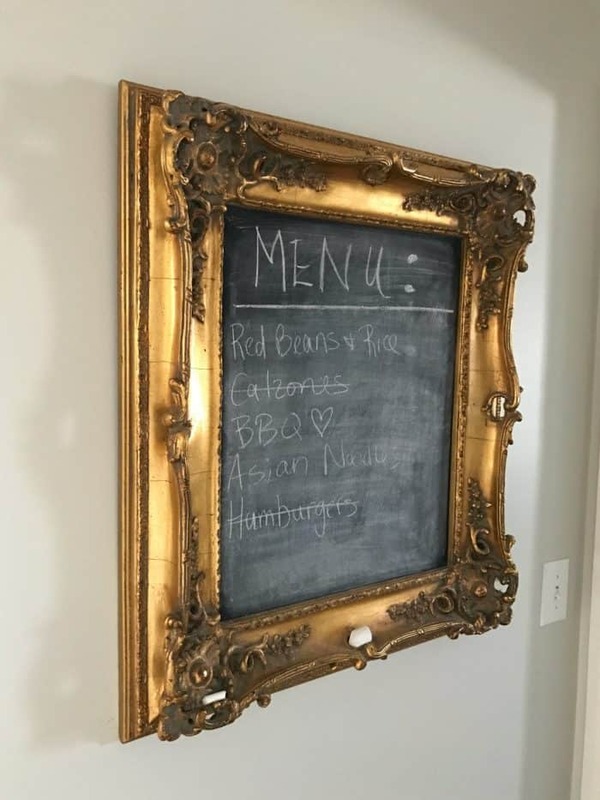 I moved the framed chalkboard to the wall in front of my pantry. Now I create my meal planning menu board by including the meals I have all of the ingredients for already on hand. Each morning when I get up I decided what is for dinner that day. From this view the kitchen is to the left. The double doors in front of the menu is the pantry. 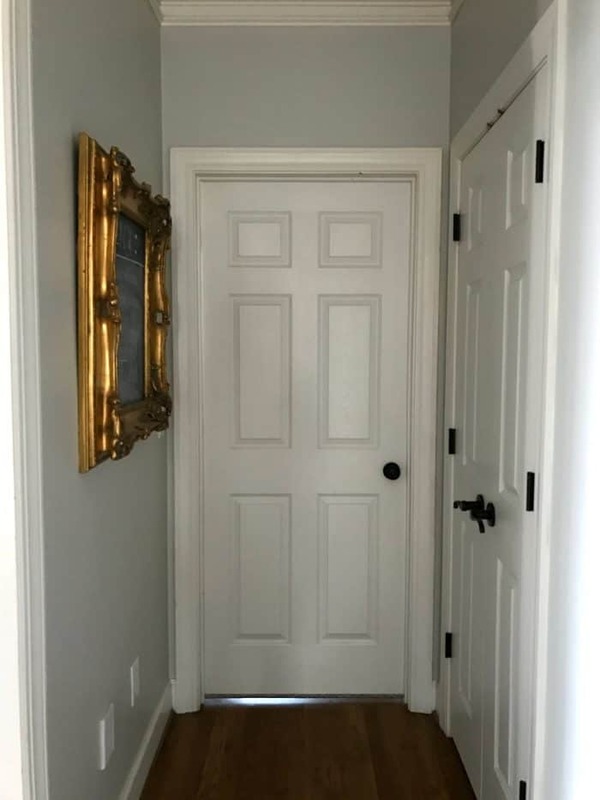 The door straight ahead is our master suite. Having the board across from the pantry is super helpful. I will mark out what we eat each day as we go. Then when I make another trip to the grocery store I will erase the meals that have been crossed out and replace them with new meals I buy. I’m trying new recipes every couple of weeks but I always make sure to buy supplies for our staple meals. I also ask the family if they have a special request for the week. If they do, I will add it to my shopping list. Those calzones for instance were a recipe out of January’s Southern Living Meal Magazine and it is a keeper! Keeping in mind my ways to save at the grocery store as well as this new meal planning strategy I can finally say, I may have this food situation down. OK, not perfect but much better. One thing I have really noticed by writing my menu out this way is the amount of meals I can come up with from my pantry and freezer. I have had as many as ten meals written out here at once. 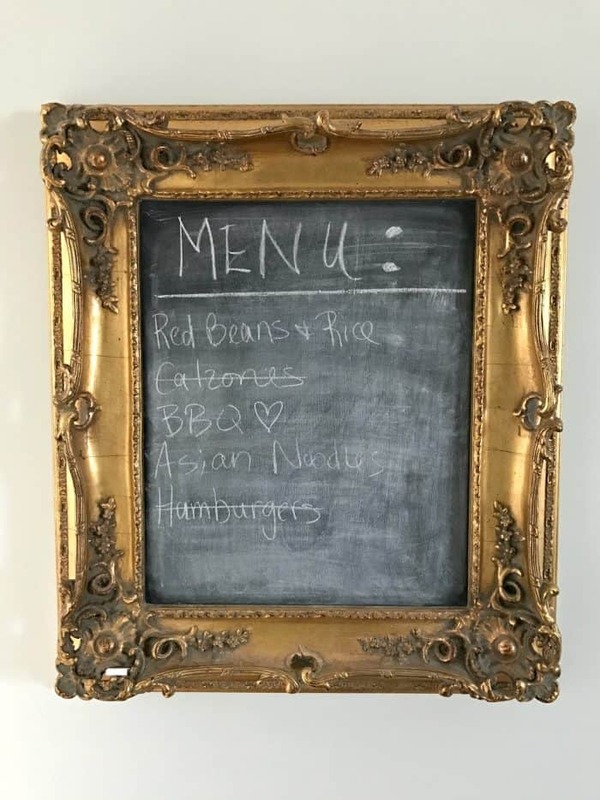 Look through the freezer/pantry and list all of the meals you have on hand on your menu board. Go shopping for more meals if necessary. Decide each morning what meal you will serve that day. Cross our the meal as you eat it. 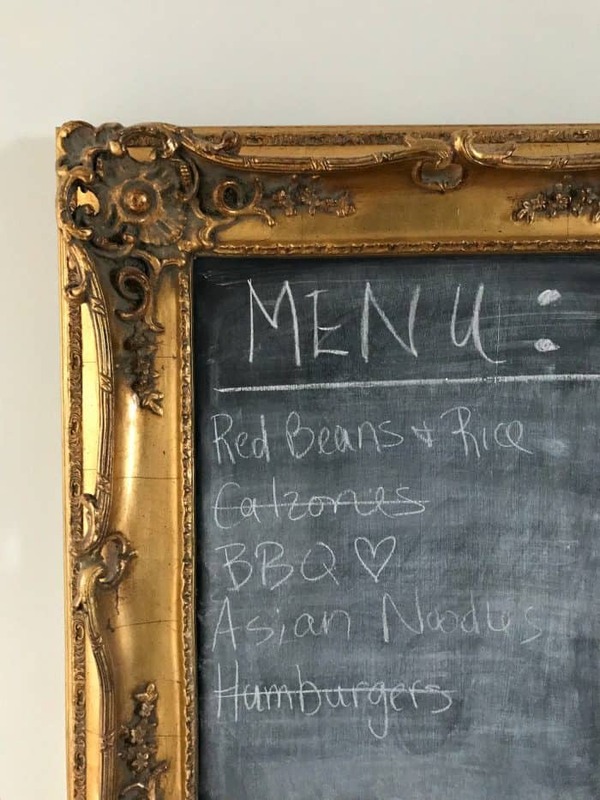 Replace those crossed out meals with new one’s the next time you go grocery shopping.